Ruffwear Life Jacket: Is The "Float Coat" Right For You? The Float Coat Ruffwear Life Jacket: Should You Buy It? With so many adventures awaiting by the sea or the lakeside, you just can’t resist going in the water. And why leave your furry friend behind? You can try taking him along for a ride as well and watch his excitement. Of course, water can be as dangerous as it is enjoyable. Unfortunately, there are a large number of dog deaths that occur due to drowning. The treacherous waters are known to pull in more than seashells. Every dog is different. Some may love to swim in the water while others enjoy it from afar. Even those that can swim get tired eventually and end up with cramps. Some dogs can only swim up to shallow waters. So, should you pack up the kayak and put it back in the basement? Absolutely not! The Ruffwear Life Jacket is the perfect solution to all your worries, especially for dogs that love swimming. These jackets are high-quality safety devices that ensure your four-legged friend is always secure. Are you looking for a dog carrier with the latest features? This product comes with a reversible sling, giving you the convenience and the style you just need. Alfie Chico Sling is 9 inches deep and can accommodate any dog that weighs 12 pounds and below. It is made up of cotton and fleece, so it is machine washable and cozy. Even though there are two versions of the pouch, one with adjustable straps and another without, we recommend the adjustable strap design for the sake of comfort. This version uses a big metal ring which enables you to switch to a strap length of anywhere between 14″ and 35″. This should allow you to get a secure fit regardless of your body size. Additionally, there is a safety collar hook that protects your puppy in this machine washable pouch. The other thing you will love about this adjustable sling is the diversity of color patterns so you can go with the one that suits your preference. The K9 Float Coat offers the following features or benefits. The design of this Ruffwear life jacket specifically caters to dogs so that it doesn’t interfere with their ability to swim. Not only is the jacket secure, but it is comfortable as well. The design features a telescoping neck that secures at the jacket to the dog at the front. Of course, this is adjustable so dogs of varying neck sizes can easily wear it. Another remarkable aspect of the design is that all the straps and the buckles on the jacket are located on the interior side of the jacket. This way you won’t have to worry about the buckles breaking or coming loose. 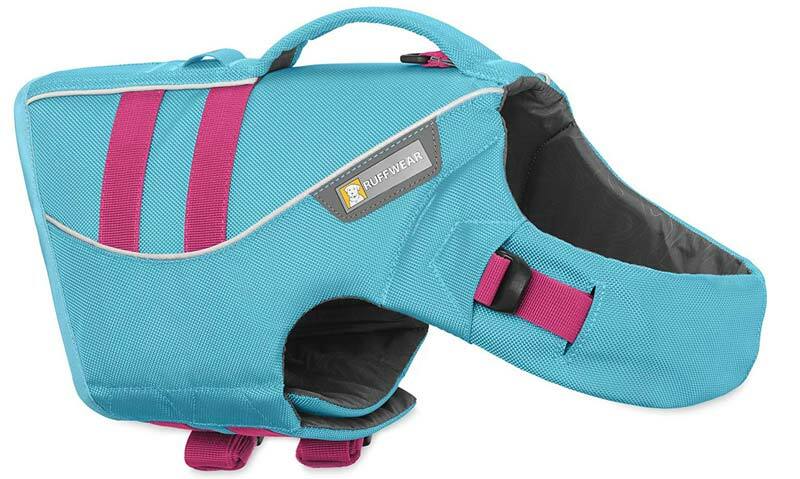 Ruffwear is popular for its high-quality materials and exquisite designs. So, it should be no surprise that they used only the highest quality materials in their life jacket. While it may be okay to use cheap quality materials for shoes or other accessories, but when it comes to safety devices, there should be no compromise. The Float Coat includes a high-quality nylon construction. It is resistant to scratches and puncturing so damage to the life jacket is almost impossible. Also, the float cells are located at a secure location so they can provide your dog with the necessary support for a long time. In addition, the nylon jacket is a one-piece construction so there are no seams or breaks. This grants added durability to the Ruffwear Jacket. It is important for you to guide your dog around the boat or in the water. Thus, the Ruffwear Life jacket comes with an ergonomic built-in handle that allows you to hold your dog and guide him through. The handle is quite sturdy and ensures you can strongly grip it without feeling uncomfortable. Also, the handle is low-profile and lightweight so, it doesn’t interfere with your dog or his swimming. Also included with the jacket are easy to clip buckles. This ensures that you don’t have to spend hours trying to prep your dog for a marine adventure. Instead, you can simply clip the buckles up and go out. Furthermore, these buckles hold the straps firmly in place. As a result, you save time on adjusting and gearing up your pup. You might lose track of time when you’re having fun with your best friend. Before you know it, it might be getting dark. The reflective trim on the jacket can help you keep track of your dog in low-light situations. So, you can stay out even longer without worrying about losing your dog. In fact, if you want to take it a step ahead, you can attach a beacon light to the built-in light loop on the jacket. Another huge benefit of the Ruffwear life jacket is that it is extremely easy to clean. You can either hand wash it or use a washing machine. However, we recommend that you use mild detergent and cold water to wash the jacket. Otherwise, you might end up damaging it or puncturing it. If your dog lies between two sizes, we highly recommend that you buy the smaller size. Buying a larger one might result in a loose jacket that can easily slip off. A smaller one ensures a much more secure fit. One of the most complaints is that the jacket costs too much. The high-quality materials and the exclusive design definitely deserve a higher price. However, customers were reluctant to pay for it after seeing other jackets being sold at a lower price. Of course, those who did buy it found it be absolutely worth the price. It can easily handle dogs twice its size without any signs of damage. On the other hand, cheaper jackets might start showing signs of wear from the first trip. Safety doesn’t have a price tag! Another gripe most users had with the product was that the leash point was tucked under the handle. This made it harder to get. Users wished for a second leash point located at a much easier to access location. At the same time, it adds a protective layer to the leash point so that it doesn’t get damaged by external elements. This is more of an aesthetic con than a functional one. However, the life jacket is available in a total of three colors only. These include blue, red, and orange. A big company such as Ruffwear could definitely afford to add in a few other color choices for those who want a larger variety to choose from. 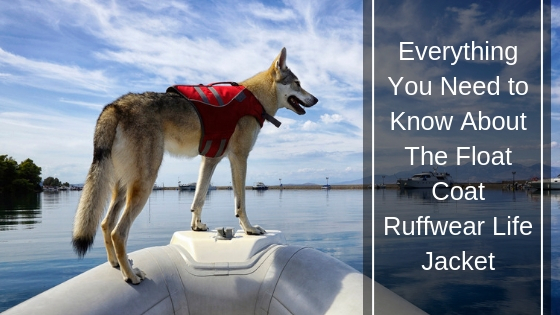 How the Ruffwear Life Jacket Can Help Your Dog? As you might be aware, dogs are natural swimmers as is evident by the term “Doggie paddle.” Most dogs get excited when they see the water. They genuinely enjoy swimming and playing in the open water. So, why is it that they might need a life jacket if they are already great at swimming? While your dog may be a great swimmer, things can tend to go wrong in the open water. For instance, if your dog suffers from a cramp or gets injured, he might not be able to swim as well. Also, the water might be too tough for him to handle. This is almost always the case with smaller dogs that cannot handle the rough waves of the sea. In addition, your dog might end up being sick, injured or just tired. In the worst-case scenario, your vessel might get damaged or it might drown. Not all dogs are natural swimmers. Some do not like the water and would rarely go into it. These dogs need a life jacket to allow them to stay afloat without needing to swim. This way, even if your dog is a great swimmer, you’ll be at peace of mind, knowing that the Ruffwear Life Jacket will keep him safe. So, no matter where you go, you can easily take your canine with you on marine adventures. Furthermore, the Ruffwear jacket comes with a leash, so you can attach it to the boat or the kayak and then let your dog splash around in the water. This way, he won’t get away too far from you and still enjoy swimming with the fishes. Even if it’s a controlled environment such as a swimming pool or a lake, a life jacket is sure to give you peace of mind. Not every jacket will fit your dog perfectly and finding the perfect fit is crucial to your dog’s safety. The best way to ensure a perfect fit is to have your dog try on the different sizes and then determine which is the best one. This way you can ensure that your dog is happy and safe. Another way would be to simply order it online. However, make sure that the online store allows you to return the package in case of sizing issues. Of course, the Ruffwear website has a measurement chart through which you can determine the appropriate size based on your dog’s chest. We recommend that you don’t rely on it too much as there are other factors involved as well. 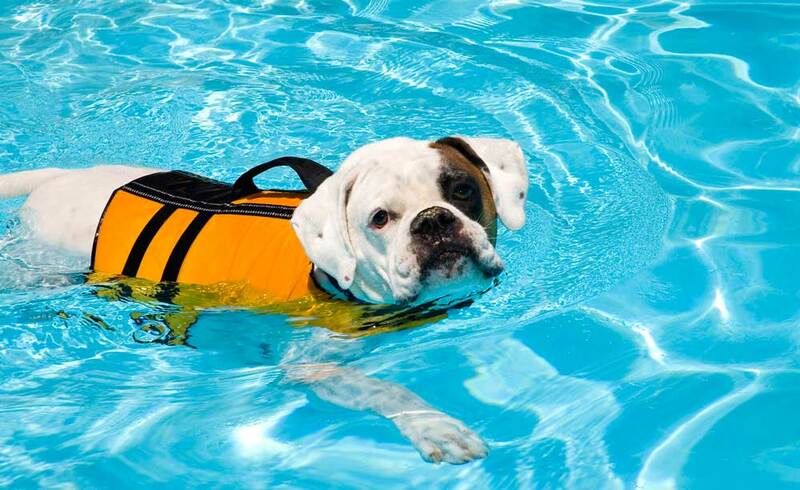 If you buy a life jacket that is too short for your dog’s long body, it might not be able to support him properly. On the other hand, if you buy one that is too long for your short dog, it might interfere with his swimming. Similarly, buying one that is too loose may result in the vest coming undone while buying one that is too tight may cause discomfort. Measuring your dog is the first step toward getting a perfect fit. Small, Large and Medium are simply subjective terms. We usually recommend that you start with measuring the total length of the dog, from the base of his neck to the base of his tail. However, Ruffwear clearly states that their products are a better fit when measured across the girth. Thus, we recommend that you measure the widest part of your dog’s chest. Other dimensions should only be considered for the most difficult dogs. When you finally receive the package, we recommend that you put it on the dog and determine if it is loose or too tight. The best indication of this is if he is not walking correctly or if he seems to be unbalanced. Another great idea is to check if the vest is blocking his legs or hindering his movement in any way. We have already mentioned what happens if the jacket is too long or too short or too loose or too tight. However, there is another aspect of a jacket not having a proper fit. The life jacket should fit properly from the neck so it can easily raise the head above the water. If the neck is too long, then you might need to exchange the jacket for one with a high neck that provides better support to the head. In addition, an improper fit can cause the lower body to sink too much. If the jacket is too short, it might not support the lower body thus, disturbing the horizontal posture of the dog. Choose a jacket that supports your dog more evenly throughout his entire body. This ensures a more natural swimming position and keeps them safer. A proper fit may ensure your dog is safe; however, if you’re careless in other aspects, it can quickly lead to an accident. Below are our top safety tips you should follow. When you start putting on the life jacket, give your pet a treat. As a result, it will instill a positive attitude toward the jacket and your dog will sit more still. Ideally, you should introduce the jacket to him long before going into the water. This way he will get used to it and won’t bother you as much in the water. There would be no point to the jacket if it kept slipping off. The best way to ensure that the jacket is secure is to adjust the straps properly. If the jacket is loose, the dog may shift in the vest, retarding his natural swimming motions. Ideally, ensure that the straps are tight enough that you can squeeze two of your fingers in them. The Ruffwear jacket comes with a leash connector beneath the handle. However, we recommend that you test out the strength of the connector before you use it. If the stitching on the connector is faulty, you could easily end up with an empty leash in your hand while your dog runs into the traffic. Even though your dog may have a jacket on, it’s still a bad idea to let him swim without your supervision. Even if it’s a swimming pool in your backyard, always ensure that you’re present there to keep an eye on him. All in all, the K9 Float Coat Ruffwear life jacket is perfect for any dog owner who cares deeply about their dog and his safety. The jacket ensures that you can include the furriest member of the family on fishing and boating trips. It includes excellent workmanship and high-quality materials that ensure the jacket never fails you in the face of any danger. So, are you ready to splash around in the water with your best friend? The Ruffwear Life Jacket makes it all possible!